It is surprising how welcome one is and how enthousiastic people are in sharing their passion for flying and aircraft, taking into account tight security and whatsoever. Last Saturday I went to Schiphol East, a nice location for spotting business jets (see full log). The hangar of the Dutch Dakota Association was being used for a presentation of a new brand in clothes, Royal Sunday and I was friendly allowed to visit the hangar. Inside the hangar was, as part of the presentation, a Cessna Mustang. It belonged to a new company, Sky-Taxi, presenting their first aircraft. Founder and managing director Roland Kortenhorst showed me very friendly around inside the aircraft. He told me many things, about what a great aircraft this was, about its ultra modern cockpit and dito instruments, about its very silent and comfortable spacy cabine. In short, the perfect office above the clouds, as is one of their slogans. The Mustang is one of a new kind of Very Light Jets. Relatively cheap in producing and thus very economic in use for taxi services. Several new companies have recently sprouted, also in the Netherlands, using these new kind of aircrafts, like Bikkair and Sky-Taxi. Roland, a former shipyard manager, and since 3 September an ex-Dutch Member of Parliament, used his experiences from many business trips to think up a new concept for an air-taxi: no-nonsense, efficient, economic, comfortable, but also with a state-of-the-art flying experience. He told me that airline pilots are jealous of this little aircraft’s ultra-modern cockpit. 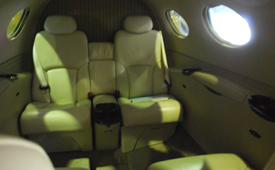 Another feature of this Cessna is its very silent cabine, thus enabling pilots the use of a light headset instead of the big earphones. 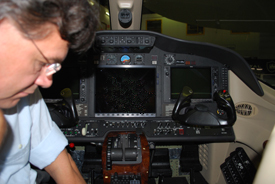 The big LCD screens and computers are capable of presenting the ultimate in destination and site awareness to the pilots, including 3D. Nevertheless, two mechanical instruments remain, the most basic of all, altimeter and artificial horizon. 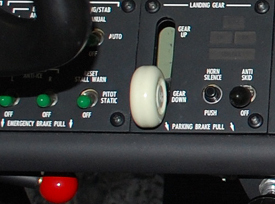 These are obliged for airworthiness, and are the minimum to safely fly the aircraft when all other systems are down! The perfect office above the clouds! In short: a great plane! This entry was posted in Bizjets by ericvdlinden. Bookmark the permalink.